To Teach is to Learn 3 times. Preface : During the transition between a File Server running Windows Server 2003 to Server 2008 R2, we experienced problems with the Folder Redirection GPO not configuring correctly. The department remapped the SAN to the new Server 2008 environment and updated the GPO’s; but to our surprise, the GPO was still looking for the old data on the Server 2003 environment to transfer to the 2008 Server. Since the data could not be transferred, the user’s systems went into “working offline” file mode. The workstations ran Windows XP Pro Service Pack 3, and resetting the File Redirection GPO to its original state did not resolve the problem either. In the event log, users were getting the following error. 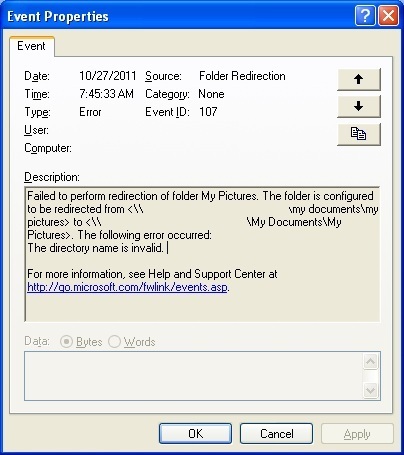 Folder Redirection Event ID 107 : Note: edited for privacy concerns. The Fix : The problem is due to fdeploy.dll on Windows XP Service Pack 3 machines. The easiest fix is to replace the fdeploy.dll on the user’s machine with a copy from a Windows XP Service Pack 2 cd. Follow these steps to obtain a copy of fdeploy.dll as well as where to place it on an each machine. If this needs to be done on a system wide level, a startup script will accomplish the same results. Step 1: Open up a command prompt. Step 2: Insert your Windows XP SP2 cd. Step 3: Type “expand D:\i386\Fdeploy.dl_ C:\temp” where D: is your cd rom drive. Step 5: Run “gpupdate.exe /force” inside a command prompt. Step 6: The computer may need to restart multiple time for the GPO to be fully applied. Step 7: Ensure everything is working correctly by checking the event viewer.